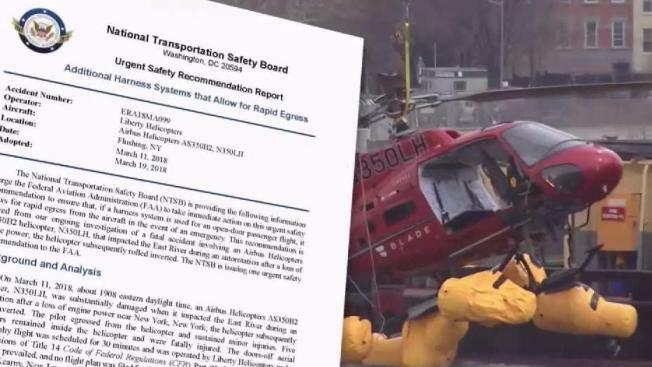 A deadly helicopter crash into a New York City river prompted the National Transportation Safety Board on Monday to call on federal regulators to prohibit commercial flights that use passenger harness systems that do not allow for easy release. The NTSB's recommendation comes after last week's helicopter crash in the East River. Five passengers who couldn't free themselves from their harnesses drowned when the helicopter rolled over into the water. The pilot, who was not wearing a harness, escaped with only minor injuries. The Federal Aviation Administration on Friday temporarily grounded open-door flights with restraints that cannot be quickly released until they're equipped with restraint systems that open with one action. The FAA also said it was conducting a "top to bottom review" of its rules covering open-door flights. The NTSB on Monday also said the harness system provided to the helicopter crash passengers "was not evaluated by the FAA." "While we applaud the FAA's intention to move forward on banning these types of doors-off flights, the FAA has not outlined how or when they plan to take action," said NTSB Chairman Robert L. Sumwalt. "And definitive action needs to be taken." "We told operators to suspend flights as soon as we identified the risk," Martin said in a statement. "More formal action regarding this communication is forthcoming."